BUT, I have made a mess out of something even Jana can now not undo, what might that be...My Followers. As you can see it says I have 23 members (right under the Join This Site). That is now the case, because I do not know what I did, and I am sorry to any and all of my sweet, loyal, and fun readers but you will have to go and CLICK on the Join This Site box (very top left) again! I admit that I am slightly retarded, computer challenged, technically delayed, maybe just OVERALL CHALLENGED is the best way to describe me. WHO knows but in this case even Patron will not help, but what will ease the pain of everyone having to "Join This Site" again is an adorable Monogrammed Necklace GIVE AWAY. Yep, I'll Give Away the above necklace (in your choice of available colors), with your initials (duh), to the winner of this GIVE AWAY. Click on JOIN THIS SITE (very top right hand side ) and follow the very easy directions to "Join This Site"
Once you have done that your picture (maybe not is you choose to not use one) should appear or I will see your name. If you were lucky enough to be one of the 23 still on the "Join This Site" (members) to add your name to the contest have a friend "Join This Site" and leave a comment under this post with your name. Anyone who gets a friend to "Join This Site" and leave a comment with your name, will be entered every time a different friend enters and leaves a comment with your name (plus I'll enter your friends name). My screw up is your ticket to a Monogrammed Necklace ( I am NOT compensated by ElizajayCharm, but they did contact me yesterday and offer to sponsor this GIVE AWAY. How incredibly sweet of them is that! I love there products (and have several), and knew you all would to (what a fab, fun trend right now) that's why I had picked them for this Give Away. I am over the moon touched they contacted me to sponsor this necklace give away. Isn't that the sweetest, they have a great products, amazing prices and offered to do this Give Away. Enter, Enter, Enter (put on Facebook with a link to this Give Away and I'll enter you again). Get your friends moving and have them "Join This Site"
* Enter the Give Away according to the above directions. For additional chances to win go to www.etsy.com/shop/ElizajayCharm and add them to your store favorites or add one of there necklace to your favorites. Give Away open to US resident only. Give Away starts Sunday, September 23, 2012 and will go till Thursday, September 27, 2012 midnight (central standard time). 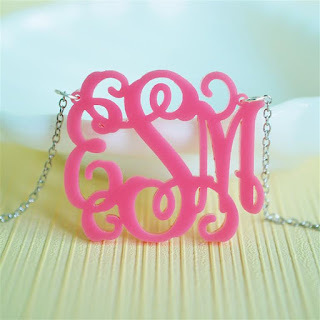 WINNER OF THE MONOGRAMMED NECKLACE GIVE AWAY: Jeanette - CONGRATS!!! i just followed you too & shared in FB! followed and shared. boo! sorry girl this is happening! so frustrating! I am a follower, and shared on FB! Just followed again and hope this works for you. I know all about messing up a blog. I'm so computer dumb it's ridiculous! HTML...forget about it! First I want to thank you so much for liking my closet design. It's not fancy--it's me! Also, love that you call your monogram your "gang sign." Can I do that also?! Hilarious!!!! So anywho, I was a follower and must have gotten lost in your shuffle, but now I'm following again! Very cute giveaway! OF COURSE you can use "Gang Sign" all us preppy girls can claim the initial interlocking monogram as our gang sign, stamp of approval, personal brand, or gateway drug to the bigger, hotter monograms (LV, Gucci, The House of Tory Burch, Lilly, all things pink and green). Why not! We are a gang of our own. It's kind of a poke in the eye, a sting, a hard pill to swallow to admit I am not a computer guru ( I soooooo try to be, but it always backfires). Oh well, problem is now fixed and I'm marching on. I found this wonderful woman to help me with all my blog problems and design my blog, after your advice to try Etsy. *you are the mentor I need. I do absolutely adore you. Thank you all for the continued support. So glad you all entered. ok posting to my "jvw home " facebook page now too! I would love to see what their monogram ring is like - I was given one by a different company and it gave me the worst rash on my finger that didn't go away for about a half of a year.....so awful! Hi, I love your style and blog very much! Recently i bought a pair of name earrings gold from GetPersonalizedJewelry, the style is very beautiful with high quality. I think you might like it. I think you might like it because it fits your outfit and style!